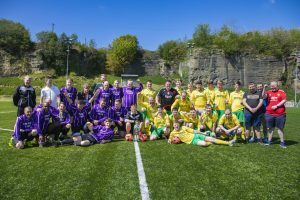 Bakers rise to football challenge to net much needed cash for hospice | News by Wales Express News, People Before Profit! A HOSPICE was the undisputed winner of a charity football match staged at the home of the oldest soccer club in Wales. Cefn Druids’ impressive stadium at The Rock in Rhosymedre was the venue for the fundraising game between Village Bakery’s bases in Wrexham and Coedpoeth. But money raised via collection boxes and buckets dotted around the ground, expected to top £400, will go to boost the coffers of Nightingale House Hospice in Wrexham. Match organiser Craig Herling, production supervisor at Wrexham, was extra busy because he was also manager of the Wrexham team and appeared as a player as a second half substitute. Village Bakery Charity football match at Cefn Mawr, to raise funds for Nightingale house. Wrexham V Coedpoeth ; Pictured are team Coedpoeth and team Wrexham. “Why raise funds for Nightingale House Hospice? Well it’s such a good cause isn’t it,” said Craig, who lives in the Borras area of Wrexham. For Craig playing on the Cefn Druids pitch was very much a homecoming. He played for the club for a couple of seasons and in 2013 captained the reserve side that won the League Cup. He was also named on the bench for the Welsh Cup quarter-final and semi-final first team victories against Aberystwyth and Airbus in 2012. Cefn eventually lost 2-0 to New Saints in the final. Last year the hospice fundraiser was played over the border at Chester FC’s Saunders Honda Stadium, but this time Village Bakery’s managing director Robin Jones paid the hire charge for the game to be staged at Cefn Druids. Watching this year’s match played under a scorching sun was Nightingale House area fundraiser Debbie Barton, who was with her mum and daughter. She said it costs £3 million a year to run Nightingale Hospice and fundraisers have to collect £2.4 million of that sum. “The charity football match is becoming something of an annual event,” said Debbie. As for the game, an evenly matched and highly competitive first half was followed by a veritable goal feast after the break. Early in the second half a penalty awarded by referee Steve Rider for handball by a Coedpoeth defender was slotted home by Wrexham team captain Jay Taylor, a viennoiserie supervisor at the bakery on Wrexham Industrial Estate. But it was Coedpoeth skipper Gary Jones, a cover supervisor, who picked up the Village Bakery Cup after his side earned a narrow 4-3 victory. Match organiser Craig said: “We had more than 30 players involved and had to keep the substitutes rolling because it was so hot. Next articleShould the SEC Have Shut Down the Titanium ICO – Initial Coin Offering – Sooner?